Well, the weather is starting to turn and with it most people’s palate… As the temperatures drop wine drinkers en masse set aside their rosés and crisp whites and move into the realm of big reds. With that being the case I figured that a Cabernet Sauvignon from Napa would be a perfect direction to take my newest “A wine you should know…” article. Now before you jump to any conclusions, let me give you some perspective. The wines from the wineries that Doug was visiting that day have a retail range of $60-200 per bottle, and because of this they need to be very selective about the juice they put in said bottles! So, logically, Doug’s next question was “Well what are you going to do with the ones you don’t use?” (again, not necessarily his exact words, lol). The winemaker shrugged (I imagine) and said that they’d put the wine up for sale and that someone would buy it and use it towards their own labels and that those wines would likely sell in the $40-70 range on the shelf (This is called “sourcing wine”, which is very common in California. Only a small percentage of wineries in the market are utilizing juice solely from their own vineyards, if they even have vineyards at all.). Well, Doug mulled over what the winemaker just said and a proverbial light bulb went on over his head… Why let other wineries come along and buy this great juice when he could!? And that, my friends, is how Hardin was born. Doug purchased a number of the surplus barrels from these extraordinary producers and worked in collaboration with them to make a wine that was his own. The first vintage was 2003, in which roughly 170 cases were made, and the wine was an immediate cult success and sold out almost instantly. Every vintage since production has been increased slightly to meet the growing demand, and it still is never enough. The current vintage, 2012, has the highest production of any Hardin vintage ever, with approximately 3,000 cases made. With that type of growth, 170 to 3,000, you would think that the quality of wine has fallen off… but the exact opposite has happened. The wine has gotten better and better over the years. Doug is still sourcing from those same high end producers, he’s simply buying more from them than he was originally. The goal behind Hardin was, and continues to be, to create a Napa Cabernet that drinks like a $50+ bottle (retail), but costs less than $30, and boy oh boy did they hit that nail right on the head. Alright, let’s talk about what you can expect from the 2012 vintage of Hardin. The wine is a blend of 82% Cabernet Sauvignon, 15% Merlot, 2% Petit Verdot and 1% Cabernet Franc… Ok, so right now some of you are reading this going “Hold on a second, that’s not all Cabernet! ?” In the state of California a wine only needs to be 75% of a particular varietal to be able to call it as such. So as long as there is 75% Cabernet in the bottle, it can be labeled as a Cabernet Sauvignon, and there is no requirement that the other varietals utilized be referenced on the front or back labels. Blending other varietals into Napa Cabernets is the norm, not the exception. There are very few Napa Cabs on the market that are 100% Cabernet Sauvignon. In terms of aging, Hardin sees 14 months in French barrel, 33% new. In the glass you’ll find a full bodied wine of dark purple hue. On the nose are aromas of black cherry, cassis, dried herbs, rose petal and faint oak. On the palate the wine is beautifully structured with a moderately soft opening leading into an explosive mid-palate with notes of cassis, black fig, tobacco, black tea and ground peppercorn, framed by subtle acidity and an assertive tannic backbone, with a long, lingering, and slightly warm finish. At 14.1% alcohol this wine is a refreshing departure from the masses of high alcohol, overblown Cabernets that the region has become known for, as is the minimal use of new barrels, with barely any oak present on the palate. 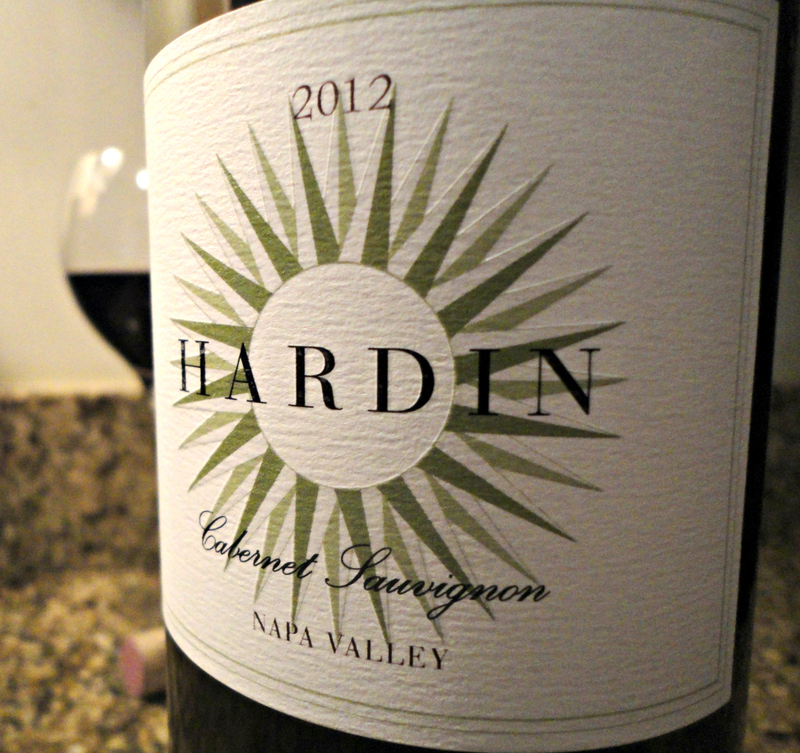 The 2012 vintage in Napa has proven to be exceptional, and Hardin’s bottling has certainly followed suit. This is a wonderful wine by Douglas and his collaborators (who I cannot name), and at the price point it goes from “wonderful” to “extraordinary”. The wine is ready to drink now, but I plan on setting a number of bottles aside to see how it evolves over the years. I would recommend that you do the same. Don’t be surprised to see a follow up “library” article on this vintage of Hardin years from now! Tags: cabernet sauvignon, doug polaner, hardin, napa cab, perfect pairings, perfect pairings at home, polaner selections, wine, wine pairings. Bookmark the permalink. Pinning this one for future reference! Cabernet is my FAVORITE and I love blended reds too! Thanks for sharing some more wine knowledge with us! This is a awesome Cab and love the story behind it as well. Doesn’t hurt either that its my last name. I have 4 12’s left and just purchased the 13′ which I haven’t opened yet. Hopefully it’s as good. I’m finding the ’13 to be quite good, though a bit different. There is an element of blueberry along the edges cutting some of the dark berry notes… not in a sweet way, just a refreshing ripeness.